Have you noticed signs of aging in your hands? I have in mine. I can claim my face is wrinkle free, but my hands are starting to look their age. Why? Because they are the last to get sunscreen and they always see the sunlight. Hands take the brunt of the aging abuse when it comes to skincare. Which is why I was happy to try out this product from Exuviance. It is called Age Reverse Hand Rejuvenator. It is a peel and a hand cream that you use together to help reverse the signs of aging on your hands, signs such as crepiness, loose skin, and dark spots, with a 10% Citric Acid Peel and a NeoGlucosamine® + CitraFill® Cream. The 10% Citric Acid Peel formulation exfoliates rough texture and smooths skin. And the CitraFill® and NeoGlucosamine® Hand Rejuvenator Cream minimizes the appearance of dark spots, smooths crepiness, and firms skin for younger looking hands. This two-step intensive treatment helps to restore smoother, firmer and younger looking hands. The 10% Citric Acid Peel gently exfoliates and lifts away dull rough patches, uncovering smooth skin and preparing for the rejuvenating cream treatment that follows. With potent anti-agers CitraFill®, NeoGlucosamine® and Apple Stem Cell Extract, the Hand Rejuvenator Cream helps diminish all the signs of aging on hands,such as crepiness, loose skin and dark spots, restoring hydration and firmer, younger looking hands. How To Use: Before bed, apply Hand Rejuvenator Peel to back of clean hands with a cotton pad or ball. Depress cotton on the top of the bottle to release the peel fluid. Smooth onto the back of hands, applying 2-3 layers. Allow the peel to absorb fully for about 1 minute. Follow immediately with a generous application of the Hand Rejuvenator Cream, focusing on the back of hands, and extending to fingers if desired. Cotton gloves can be worn over the cream if desired. In the morning, apply the Hand Rejuvenator Cream to the back of hands and allow at least one hour before washing hands. The Hand Rejuvenator Peel should be used every night before bed. The Hand Rejuvenator Cream should be worn twice a day, in the evening after the peel and first thing in the morning. Sunburn Alert: This product contains an Alpha Hydroxy Acid (AHA) that may increase your skin's sensitivity to the sun and particularly the possibility of sunburn. Make sure to use a sunscreen, wear protective clothing, and limit sun exposure while using this product and for a week afterwards. Even though the lighting is different, you can still notice the HUGE difference in my hand. Prior to use of the peel and cream, my hand was dry, starting to look crepey, with loose skin, it had some spots on it and it did not look its best. Now, and this is without any filter on it, my hand looks phenomenal. The skin is even toned, it is moisturized, the spots are gone and it has an overall nice looking, smooth appearance. I am going to keep using this peel every so often when things start to go south to keep my hands looking nice. And I am going to wear a broad spectrum sunscreen of at least SPF 30 daily to maintain the results. If there is one beauty product that is definitely worth it, it is the Age Reverse Hand Rejuvenator. I cannot believe what a huge difference it made in my hands. I am very happy with the results. 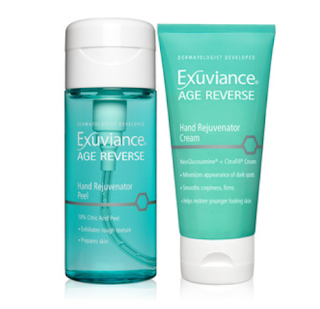 The Exuviance Age Reverse Hand Rejuvenator retails for $65.00 and is available from www.exuviance.com, www.dermstore.com, www.ulta.com and www.skinstore.com. Exuviance is one of the brands that is under the NeoStrata Skincare company. Like NeoStrata on Facebook: https://www.facebook.com/NeoStrataCompany; Follow NeoStrata on Twitter: @neostrataskin; Follow NeoStrata on Pinterest: https://www.pinterest.com/neostrata/; Follow Exuviance on Instagram: https://instagram.com/exuviance/; Follow NeoStrata on YouTube: https://www.youtube.com/channel/UCf_jdb_vpqIWkgUcNRHIWIA; Follow NeoStrata on Google+: https://plus.google.com/+NeostrataIncPrinceton.